This post is one of the five finalists in our second Stat Geek Idol contest. It was conceived of and written by Ryan Silvis. In 1978, a then promising young coach at Army, Mike Krzyzewski, interviewed for the vacant Northwestern coaching job. Northwestern offered the position to a different coach and Coach K went back to Army only to be hired by Duke in 1980. Since, Coach K has led Duke to 29 NCAA Tournaments, while Northwestern is still looking for their first. Northwestern is again looking for a new coach and hopefully Athletic Director Jim Phillips is on the Stat Geek Idol judging panel, because I will tell him who he should hire. First things first, let’s dismiss what seems to be the popular choice of Duke assistant Chris Collins. Since 2003 only four first time head coaches were hired into a power conference. As you can see in Table 1 below, none of the coaches were able to improve the team three years after they took over. In fact, on average they made the program worse by 18%. In addition, according to data gathered from the Office of Postsecondary Education, Northwestern spends the least amount of money on its basketball operations in the Big 10. In fact, from 2003-2011, Northwestern has spent $11M less than the average Big 10 school and $40M less than Michigan State. It is foolish for Mr. Phillips to think that any assistant coach can turn a program around with the type of budget. If Northwestern truly does want to turn the program around, they should hire an established head coach. Since I don’t see any power conference coaches willing to take a pay cut to lead the Wildcats, they will have to look at the mid-majors. The question is, how do you know what coach can turn Northwestern around? To answer that question, I developed a coach ranking system based on two factors, talent accumulation and in-game coaching. 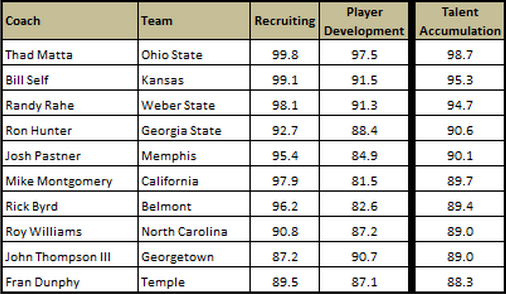 The first component in my coaching rankings is talent accumulation and is broken down into two parts. The first part is how well the coach gets talented players into his program and is calculated based on the productivity of each player in their first season with the coach (including freshman and transfers). The second part is player development and is measured by the increase in productivity over each player’s career. My chosen measure of player productivity is Win Shares and I’m only using conference games from 2003-2013 where the players have played more than 100 conference minutes. 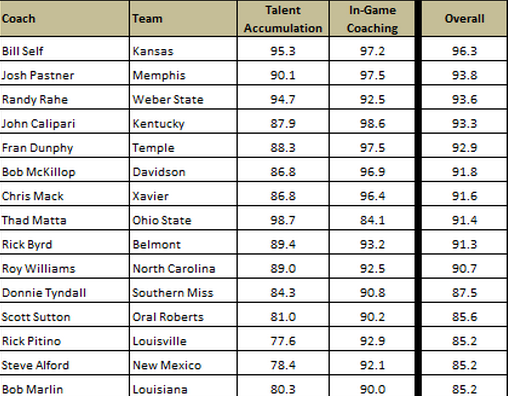 Table 2 above shows the top 10 in talent accumulation and includes five mid major coaches and 5 power conference coaches. The beauty of only using conference games is that it measures each coach based on similar competition. All of the mid-major names on this list recruit well for their systems and have accumulated talent that is far superior to the rest of their conference. 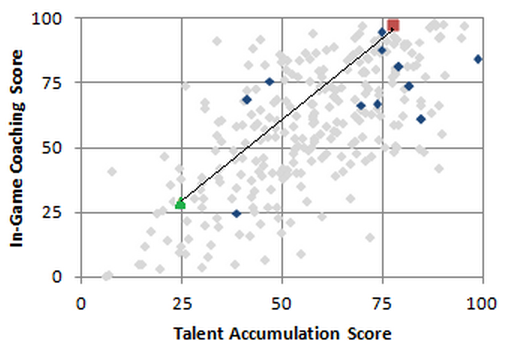 Graph 1 above shows the strong relationship between talent accumulation and career conference win % with an R2 of .6737. 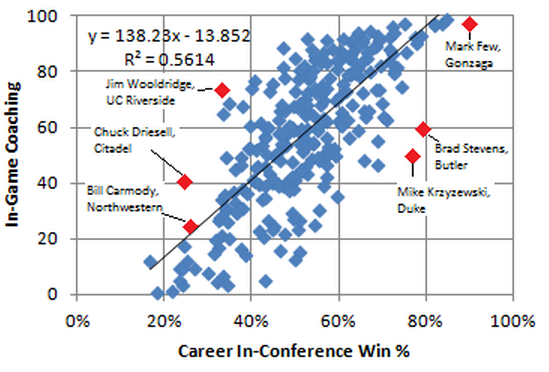 Former Northwestern Coach Bill Carmody falls near the bottom 10% of all coaches in this measurement. Now that we have established how much talent each coach has on their roster we need to find out how well the coach used the talent on his roster in games. To determine an in-game coaching ranking, I took the difference between the Vegas spread and the final outcome for each game. If Team A is favored by five points, Vegas views the talent of Team A as five points better than Team B (also reflecting other factors such as home court advantage). Let’s say Team A wins by nine points. Team A would receive a +4, while their opponent would receive a -4. The problem is that Vegas doesn’t produce a line for the Tuesday night Robert Morris vs St Francis game. To keep everything consistent, I used adjusted efficiencies similar to kenpom to come up with an implied line. The implied line has an R2 of .82 and does a good job of approximating team A’s skill vs team B. 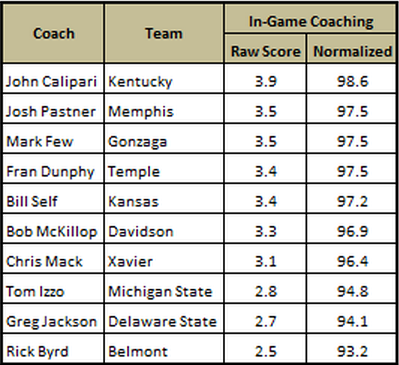 Table 3 above shows John Calipari is top dog by averaging +3.9 points above the implied line. Bill Self again finds himself in the top 10 and is the only power conference coach to appear in the top 10 of both categories. Other coaches that appear in the top 10 of both lists are John Pastner, Fran Dunphy, and Rick Byrd. 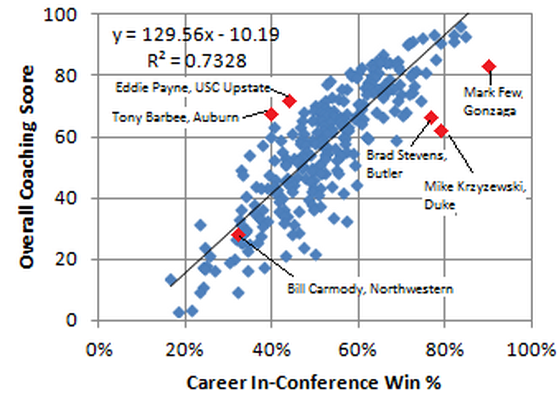 Graph 2 above shows in-game coaching correlates a little less to conference win percentage as talent accumulation, but it still has a significant relationship with an R2 of .5614. Again, former Northwestern Coach Bill Carmody falls near the bottom of In-Game Coaching. The top 15 coaches are listed in table 4 above. Bill Self has established himself as the man to beat with a wide lead over second place. Five of the top 15 are from power conference schools. 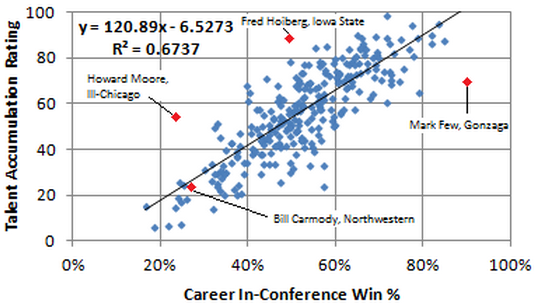 On the right side in Graph 3 above is the Overall Coach Rating vs Conference Win %. There is a strong relationship between the two with an R2 of .7328. Some of the outliers highlighted on the right side of the graph (Few, Stevens, and Krzyzenwski) indicate that there is some other factor not considered in my model that causes these coaches to win. I suspect this may be a combination of team prestige and much larger operating expenses compared to other members of their conference. 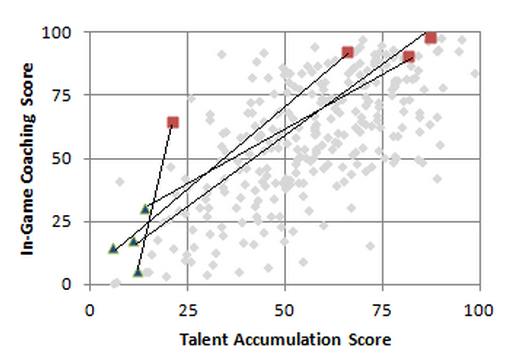 Using Northwestern’s previous coach Bill Carmody’s ratings of 24 and 28, Northwestern should hire a new coach with ratings of 77 for talent accumulation and 97 for in-game coaching. Graph 4 below shows the improvement made to the coaching changes that resulted in a 20% winning percentage increase. Graph 5 below depicts current Big Ten coaches and where Northwestern needs to be in order to increase their winning percentage by more than 20%. Of all the current active coaches only three have greater than a 77 for talent accumulation and 97 for in-game coaching: Memphis’ Josh Pastner, Temple’s Fran Dunphy, and Davidson’s Bob McKillop. Josh Pastner and his $1.7 Million salary is too high for Northwestern. Bob McKillop appears to be staying put at Davidson. That leaves us with Fran Dunphy. Before last season, Dunphy’s peers named him the most underrated coach in America. When Dunphy took over the Temple program, it has not been to the NCAA tournament in five years but he has since took them to the tournament six out of the last seven years. Dating back to when Dunphy was at Penn, he has made the NCAA tournament 15 times. Dunphy would be hard for Northwestern to land, but he currently makes $700,000 a year which is quite a bit less than the estimated $1.1 Million Bill Carmody made. And who knows, maybe Dunphy doesn’t want to be the most underrated coach in America and wants to be known as the guy who took Northwestern to the NCAA tournament?